The Open APC initiative releases datasets on fees paid for open access journal articles by universities and research insitutions under an open database license. Open APC - supported by the DINI Working Group Electronic Publishing - is part of the INTACT project and located at Bielefeld University Library. INTACT aims at establishing transparent and efficient procedures to manage article processing charges (APC) for open access publications. The project is based on the understanding that the transition from a subscription based market towards open access can only be achieved if higher education and research institutions and their libraries collaborate and work with publishers on both parameters and lean workflows. INTACT will examine how open access publishing is distributed over German research institutions. This will form the basis to predict future costs. An open data service for article charges will be established. These datasets on fee-based publishing can be reused to make cash flows between research institutions and publishers more transparent. The project looks at the business processes of the evolving APC market and proposes efficient workflows while involving all parties such as funders, libraries, and publishers. Open APC that releases datasets on fees paid for Open Access journal articles by Universities and Research Society Funds under an Open Database License. Open APC initiative aims to demonstrate how reporting on fee-based Open Access publishing can be made more transparent and reproducible across institutions. This project was set up in collaboration with the DINI working group Electronic Publishing. It follows Wellcome Trust example to share data on paid APCs and recognises efforts from JISC and the ESAC initative to standardise APC reporting. The Open APC datasets demonstrate transparent and reproducible reporting and allow various cost analysis on fee-based open access publishing across institutions and publishers. 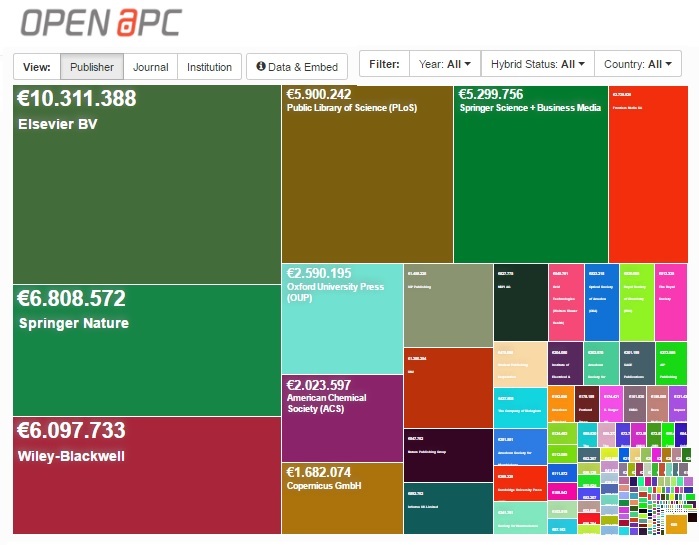 At the moment Open APC project provides cost data on 31,645 open access journal articles, amounting to € 58,157,667 and contributed by 94 research performing institutions and research funders. The average payment was € 1,838 and the median was € 1,653. 18,695 articles in the dataset were published in fully open access journals. Total spending on publication fees for these articles amounts to € 26,209,279, including value-added tax; the average payment was € 1,402 (median = € 1,339, SD = € 621). Hybrid open access journals, which allow articles to be published immediately as open access after a charge was paid, rely on both publication fees and subscriptions as revenue source. This dataset covers 12,950 open access articles being published in hybrid journals. Total expenditure amounts to 31,948,388 €. Average fee is 2,467 € and the median 2,469 €. Metadata representing journals or publishers were obtained from Crossref in order to avoid extensive validation of the records. The datasets are made available under the Open Database License. Any rights in individual contents of the database are licensed under the Database Contents License. Open APC uses GitHub for aggregating data provided by universities and research institutions, new contributions and changes will also be displayed on the INTACT Blog and at treemap visualisations. The treemaps present the most easy and intutitive way to browse and inspect the Open APC data. It is possible to either view the data for single institutions or the whole data set.